Review Airnorth luggage allowances and charges before travelling. Struggling to fit all your luggage within Airnorth's baggage allowance? Then avoid checked baggage altogether by shipping your luggage to your destination with Send My Bag. Find out how affordable it is to send your luggage with a free quick quote. Once you have enjoyed a luggage-free journey, you'll never travel with luggage again. 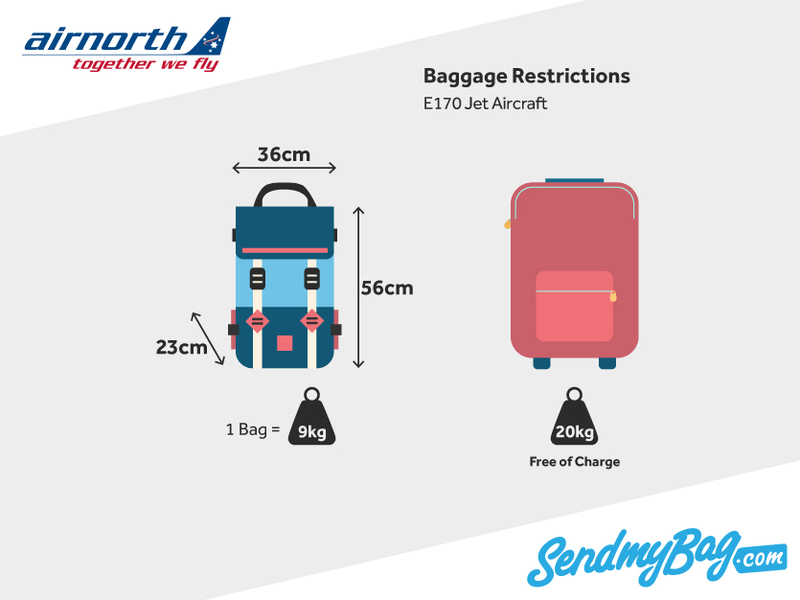 The amount of hand baggage permitted by Airnorth’s baggage allowance depends on the aircraft being used. On the E170 Jet aircraft, passengers are allowed a bag weighing no more than 9 kg and measuring a maximum of 56 x 36 x 23 cm, with its total linear dimensions not exceeding 115 cm. On the E120 Brasilia aircraft, the hand baggage allowance reduces to 4kg and dimensions of 48 x 34 x 21 cm. Finally, on the smaller Metroliner 23 aircraft, only small, soft handbags are permitted on board. Flammable liquids, such as paint. E170 Jet: 20 kg, E120 and Metroliner: 13 kg. If baggage exceeds 13 kg on the smaller aircraft, it may be accepted. If baggage exceeds 20 kg, an excess baggage fee between A$5 to A$10 per kg will be charged. If travelling with an infant you may also check in a stroller or a carry basket, plus 10 kg of checked baggage, in addition to your own allowance. Looking for Airnorth sized hand luggage?